Hello and welcome to my fishing site. My name is James Busser and I am from Langley, British Columbia, Canada and I am an avid fisherman. I am unlike most fisherman as I fish everything from rivers to lakes to oceans. I enjoy fishing for trout in a small lake as much as i enjoy trolling for salmon in the open ocean. On this website I will take you through my adventures of fishing and give you some tips and tricks that i use to catch fish. Each page will be a different lake and I will show multiple trips and show detailed pictures of the lures or flies I used as well as instructions of how I used them. I hope you enjoy my fishing experiences and I hope it inspires you to make some of your own. Feel free to email me anytime, and check out the new Facebook and Instagram page. Caught a couple nice Coho off West Vancouver, Happy Canada Day!!! Check out the latest report. 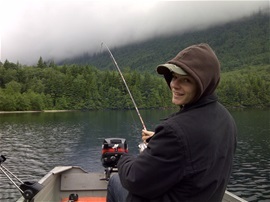 The best fishing at the moment lies in the Harrison area lakes and rivers, and its all trout fishing. Check out the report. Find out where to catch your first fish of the year. British Columbia has some of the best and diverse fishing in all of the world. 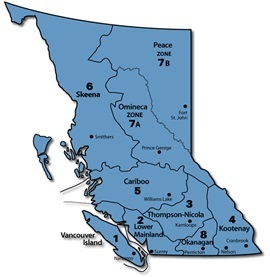 BC's coast is home to the Pacific Ocean which offers very diverse fishing regions. To fish this you will need a tidal fishing license with the appropriate stamps. 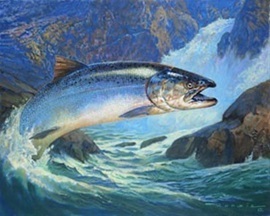 Some popular game fish are the five pacific salmon (Chinook, Coho, Chum, Pink and Sockeye), Lingcod, Halibut and Tuna. Trolling with downriggers is the most popular way of fishing;There is also many opportunities to fish for crabs and prawns with traps on the ocean floor. BC is home to thousands of lakes with 10,052,684 fish being stocked in 778 lakes and climbing every year. Popular game fish in BC lakes are: Rainbow trout, Cutthroat trout, Brook trout, Lake trout, Bull trout, Burbot, Artic Char, Dolly Varden, Kokanee, and Bass. There are many methods of fishing although fly fishing and trolling seem to be the most popular. BC's rivers are the passage ways for Salmon to come from the ocean and spawn to. All five pacific salmon can be caught in river systems as well as steelhead being another popular fish. River fishing is much different as you don't use a boat. On smaller systems you put on your hipwaders and hike up and down rivers trying to catch fish. Fly fishing can be very productive on rivers. Hi James. Wrote you an email too. Looking for someone with a boat to take a photographer under the Port Mann Bridge. He'll be in town July 18-22. Ideas? how is Stave River and Dewdney slough for coho this time of year? When would you recommend I fish them? hi jimmy james im near hope shore fishing recommendations ? Mike, I know the bass-catcher's mom and spoke to him in person. He had the pic of the bass, which ran in the paper. He could have hoaxed it — but I doubt it. Barry, I read somewhere that the old report of the bass was a "hoax". I don't know any details. As far as I'm aware, none have been caught since. Mike, I'm the sports writer for the Hope Standard and I wrote of a local, named _ Peterson, who caught a bass in the lake. It was about 2005. None since?